Bake 37 to 47 minutes or until top is dark golden brown and cracks feel very dry and are not sticky. Do not underbake. Immediately turn pan upside down onto glass bottle until cake is completely cool, about 2 hours. Meanwhile, in 2-quart saucepan, beat egg yolks, sugar, cornstarch, orange juice and salt with wire whisk until blended. Add butter; cook 2 to 3 minutes over medium heat, stirring frequently, until boiling. Boil 3 to 5 minutes, stirring constantly, until thickened and mixture coats the back of a spoon. Immediately pour orange mixture (orange curd) through fine-mesh strainer into medium bowl. Cover with plastic wrap, pressing wrap directly onto surface of orange curd. Refrigerate about 1 hour or until completely chilled. In medium bowl, beat whipping cream on high speed until stiff peaks form. Fold whipped cream and grated orange peel into orange curd. On serving plate, place cake with browned side down. Cut off top 1/3 of cake, using long, sharp knife; set aside. Scoop out 1-inch-wide and 1-inch-deep tunnel around cake. Set aside scooped-out cake for another use. Spoon 1 1/3 cups orange cream into tunnel. Replace top of cake to seal filling. Frost top and side of cake with remaining orange cream. Refrigerate at least 2 hours before serving. Garnish with orange twists. Store covered in refrigerator. When making fresh orange curd, it’s important to stir constantly to help prevent any of the egg from cooking too quickly. If this does happen, strain the mixture through a fine-mesh strainer to easily remove any cooked bits. 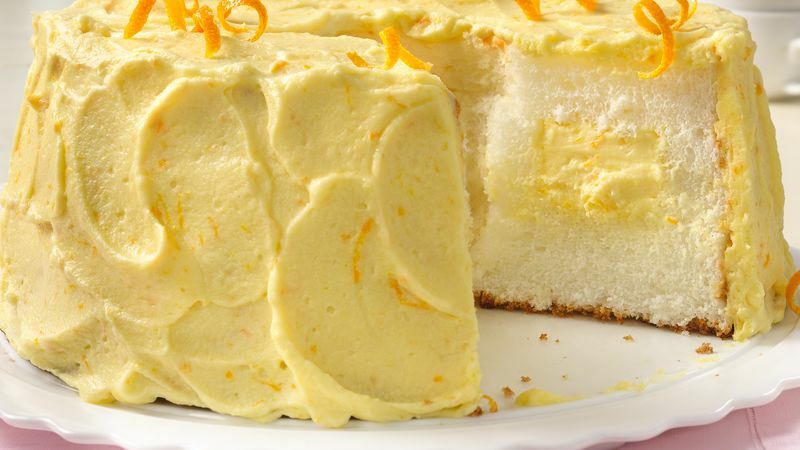 When frosting this cake, first seal in the crumbs by spreading a thin layer of orange cream around the side of the cake. Then frost the top and go back over the side for complete coverage.